Collaborating Cores is a function that allows cores to share an individual requester's project request among one or more cores. 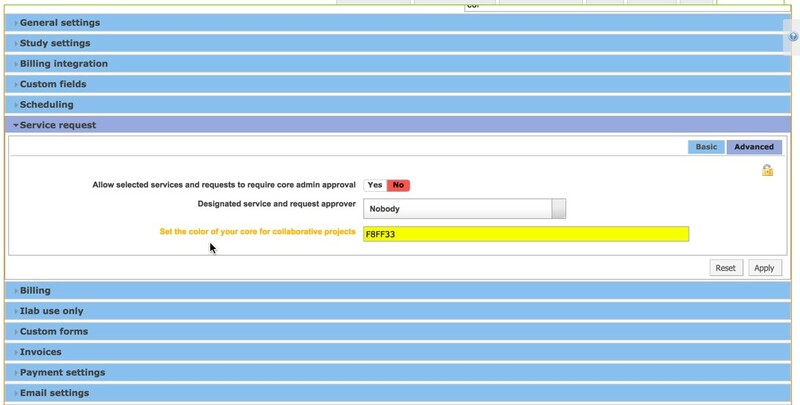 When shared from the parent core, each core is able to add, edit, complete and delete their own services from the project request. Cores are also able to bill for their own services no matter which core the project originated it. By default, the parent core is the only core able to complete the project request as a whole. Note: This is an institutional setting that must be enabled. Once enabled, individual cores have the ability to select other cores within their institution with which they will collaborate. Please contact your iLab Project Manager as soon as you believe that the core you are working with may need to use this feature. You should also make sure that your core is assigned a unique color. This is an advanced setting under the Service Requests Settings‍ of “Other Settings” and requires an iLab employee to set for you. Each core collaborating with one another should have a different color designation. When implementing collaborative cores, a “group” training session between all of the cores to cover the “collaborative” addition to their workflow is needed. If cores are newly implementing, this should occur after the workflow portion of training for each core has taken place. To see the addition of collaborating cores in your site, you will need to navigate to the View All Requests tab and expand an existing project using the blue triangle on the left hand side. 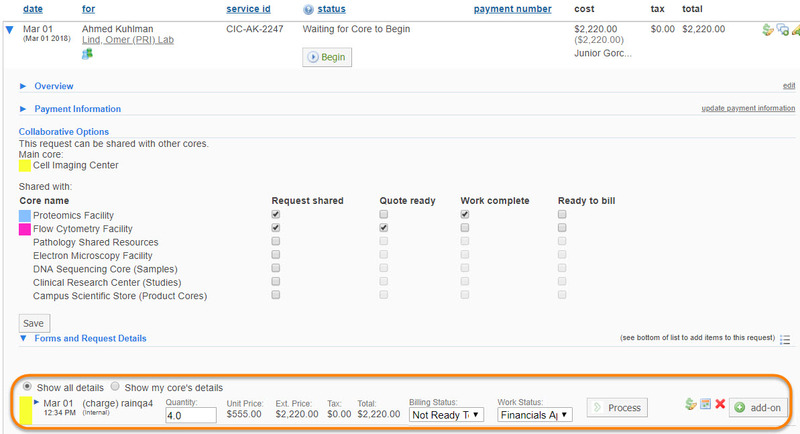 You will see a new section that displays under “Payment Information” that shows “Collaborative Options". Now, choose and select the appropriate tick-boxes to indicate which cores this core will share the selected project with. NOTE: It will be very important when you train your cores that you illustrate that your core should only use the first column (Request Shared) for this initial stage of collaboration. You’ll notice now that a new icon displays next to the collaborative project. You can see who the originating core is by hovering over this icon, as well as by referencing the Service ID. The project will now show on the View All Requests tab for all collaborating cores. 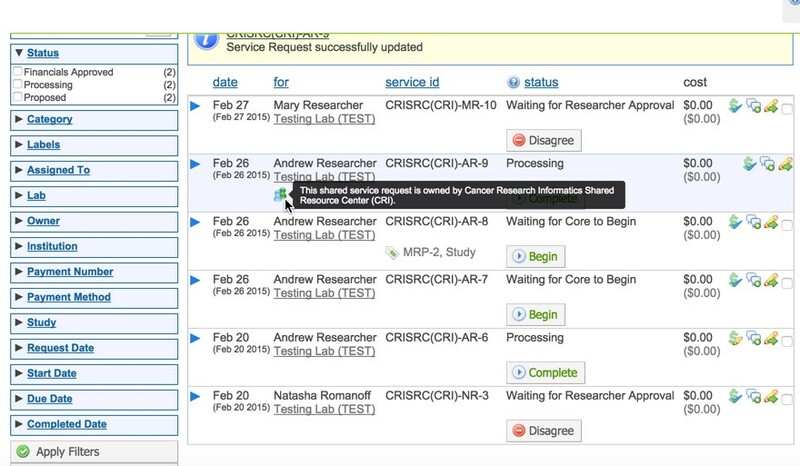 The next step in the workflow allows each core (that has been added as a collaborator to this project) to add their own core specific Forms, Service Costs, and Milestones. Each addition to the project will be identified by a corresponding color flag to the immediate left of the form/service cost/etc. NOTE: Every core that is collaborating will be able to see and review all of the information (forms, costs, milestones, attachments, urls and comments) that each core is adding to the project. Cores are only able to adjust their own core specific details (i.e. forms, costs, milestones). This allows each core to add, amend, edit, complete, and bill for their own services independently from what the other collaborating cores may be doing to the overall project. The ability to close and complete the project in its entirety is the sole provenance of the originating core. Originating and collaborating cores involved with the project will be able to keep abreast of the projects using the status table. In order to use this status table it is incumbent upon each of the collaborating cores to update the Quote Ready, Work Complete, and Ready to Bill columns as each of those states is reached. This will communicate to the originating core when it is appropriate for them to complete and close out the entire project. Once all of the collaborating cores have marked on the status table that their portion of the collaborative workflow has reached the “Ready to Bill” status, the final step in the process is to have the originating core close and complete the project.